Well, it’s finally here. 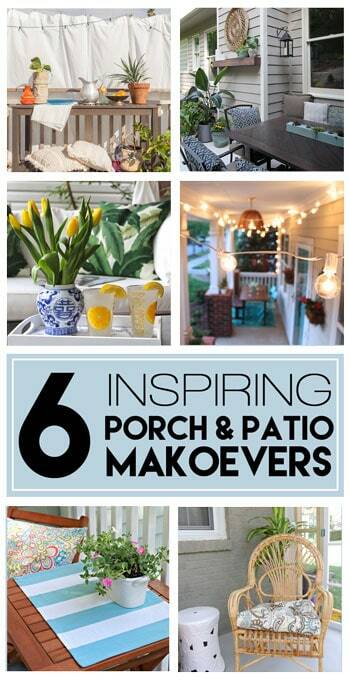 The past 6 weeks have been devoted to giving our Porch and Patio a complete makeover as part of the One Room Challenge and it seems to have come and gone so quickly. The most exciting part now though, is we get to enjoy these spaces this summer and beyond. First, I’d like to thank our host of the One Room Challenge, Linda from Calling It Home. This has been a fun ride, and while my family is happy this is over, we honestly couldn’t be happier with the results. I find it very unlikely that I would have even begun to achieve these makeovers without this challenge. 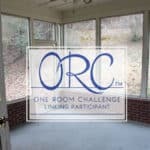 You all must be sure to check out the other amazing rooms, by both sponsored and linking participants. So much talent and so many beautiful spaces have been created. 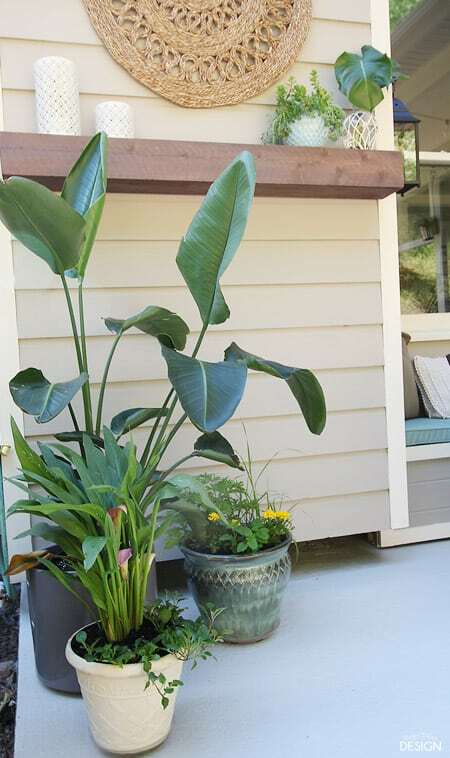 I’m going to start the reveal on the patio. 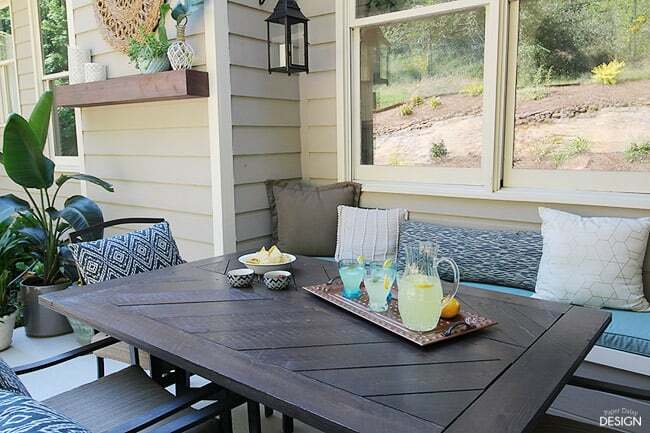 Besides giving you a sneak peek at the built-in banquette, I had not revealed much of my plan for out here. To the back side of the fireplace and added this rustic mantle. Creating a focal point with the existing architecture was a great way to incorporate it into the space. The tutorial for this simple build can be found here. It only costs $15 to build! 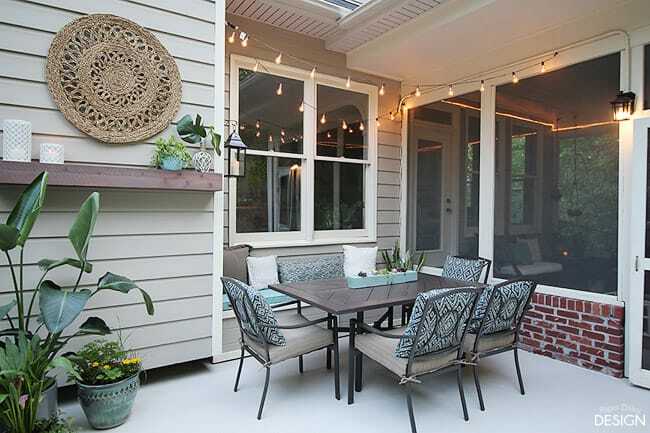 Without taking full advantage of the nook created by the fireplace and adding the banquette to the space, the patio would not accommodate this much seating and still allow traffic flow in and out of the screen porch. Our exixting table was the wrong size and scale so we built a new top customized to fit the space. You can read how to build your own Herringbone tabletop here. 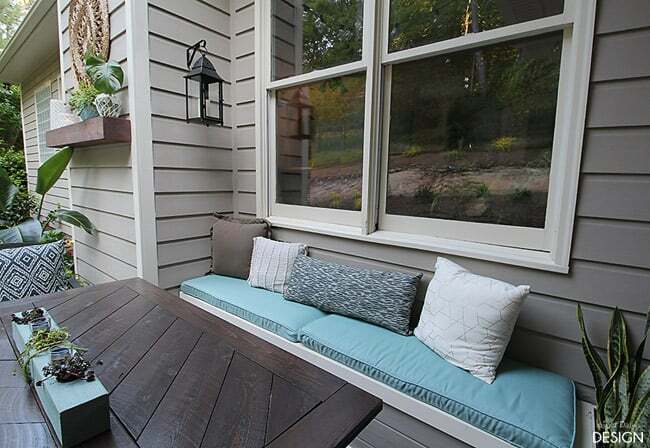 Moving inside the screen porch, the fabrics are repeated to bring a sense of continuity between the two spaces. 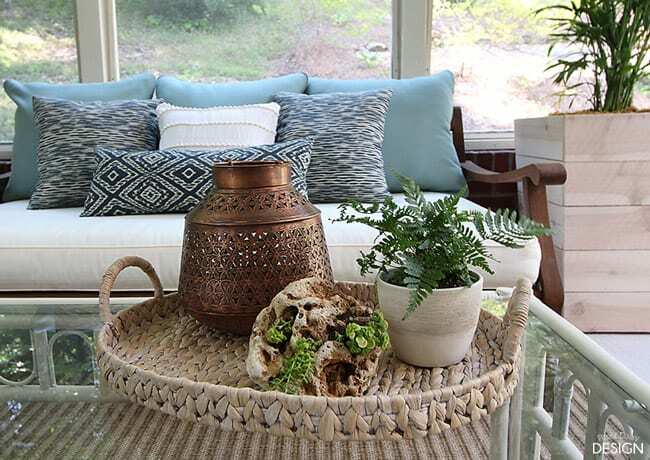 For this navy and neutral color palette I focused on textures and layers of calming, subtly tropical and botanical accents. 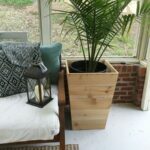 The planters we built out of cedar fencing add height and drama to the long side of the porch. 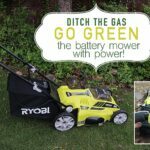 Plans and a complete how-to can be found here. 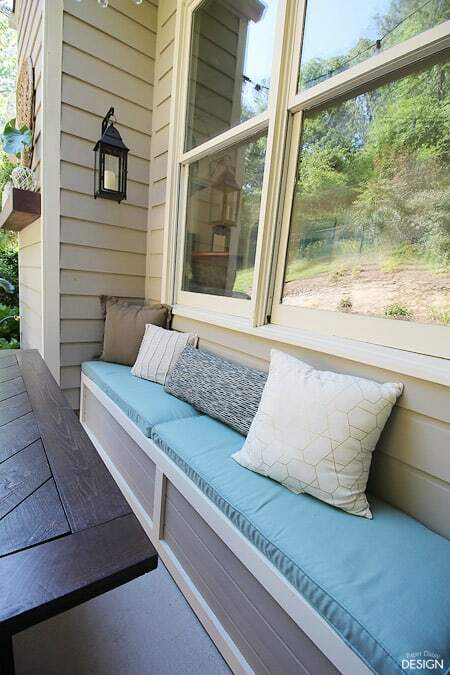 This is not a very large porch, but I wanted to create enough seating for our family and guests to enjoy bug free. 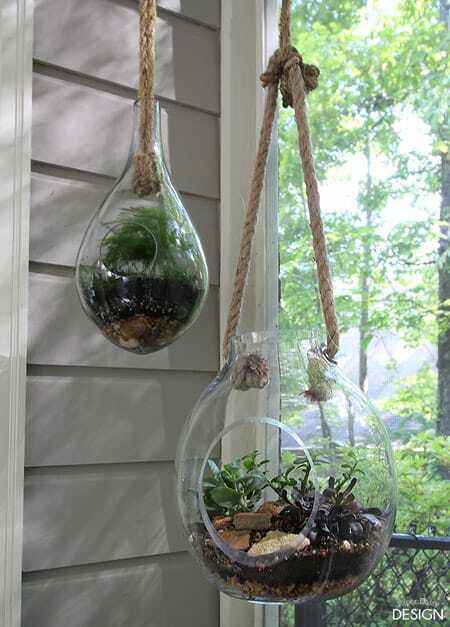 I have created numerous terrariums over the last few years and have learned a thing to two. 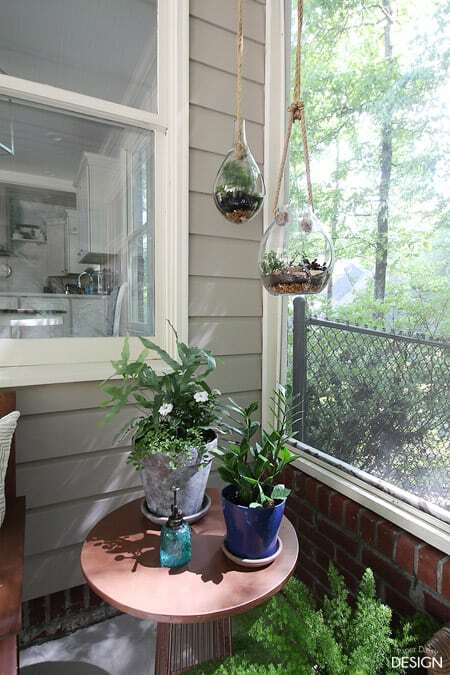 Look for a tutorial on how I created these hanging ones soon. And now for a look at the space lit up at dusk. You’ll see Tucker, our Goldendoodle, joined me as the sun began set. He’s wondering when I’m going to move all these pillows out of the way so he can have his outdoor bed back. Thank you all so very much for following along with me on this journey. It’s been challenging and rewarding to completely makeover these spaces. And there you have it, the last photo. I think we are ready to throw a party! We are so NOT done out here. Next up, were are expanding the plantings around the rock on the hillside and adding a built-in grill and countertop. So, if you haven’t already, you’ll want to pick your favorite social media to follow me as we continue to transform our whole backyard. Follow me on Google+, Facebook, Pinterest, Instagram or subscribe via email. Also, see the bar at the top right for links. And of course, a huge repeat thank you to Linda! 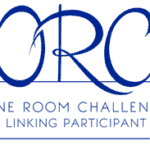 Be sure to check out the other linking participants as well as the sponsored challenge designers. If you want to track back and see the progression of the challenge you can do so here. 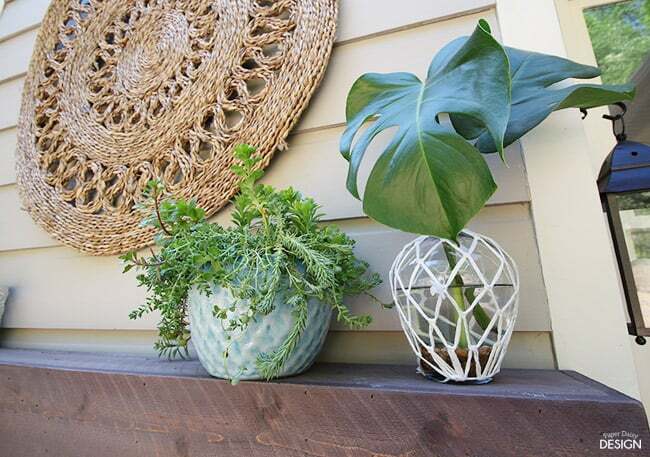 Want more inspiration for your outdoor space? 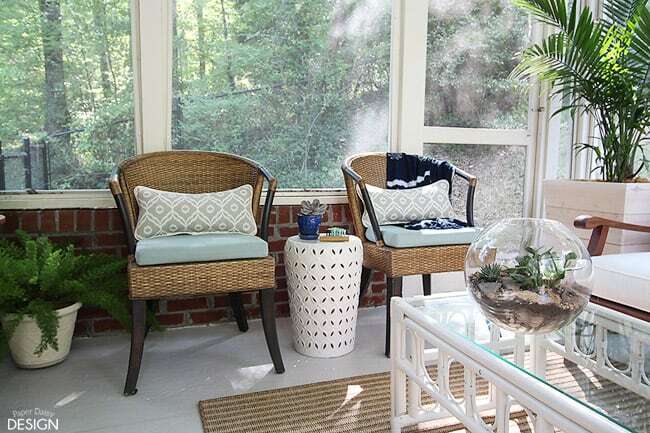 Check out these amazing porches by clicking on the photo below. Such a beautiful and tranquil respite! 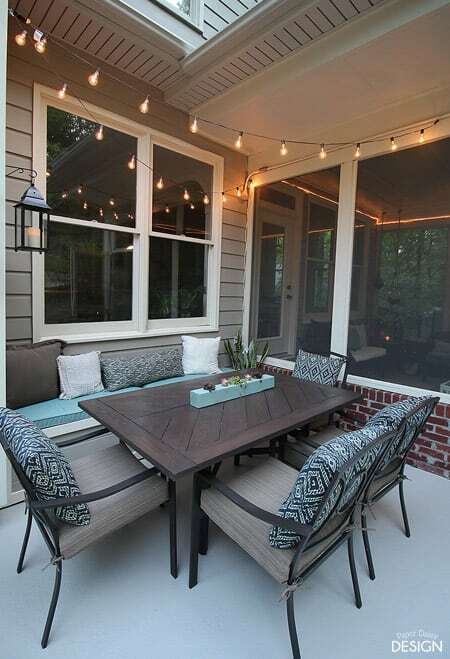 I would love to relax with a cup of coffee on this patio! Congratulations on an amazing transformation!! Wow! Looks amazing! I just love how the two spaces work & flow together. You have really nice details – and I love your fabric choices. I’m sure you’ll enjoy this space! Great job! Thanks so much! That is exactly what I was trying to accomplish. What a lovely space! I could stay out there all day! Way to go! Looks beautiful! Nicely done. Love what you’ve done with the space. Gorgeous. This is where I would be all summer. 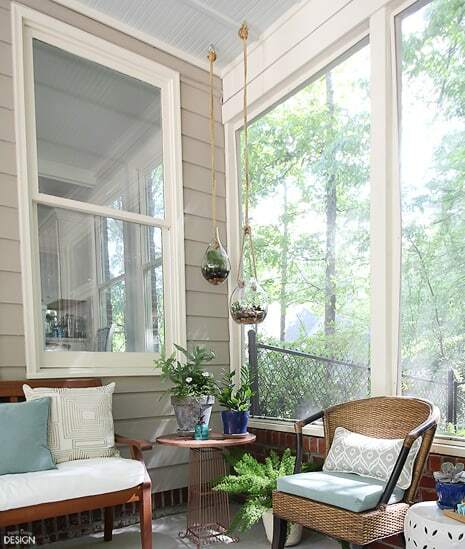 I love your porch, so inviting and what a fabulous space to hang out in. 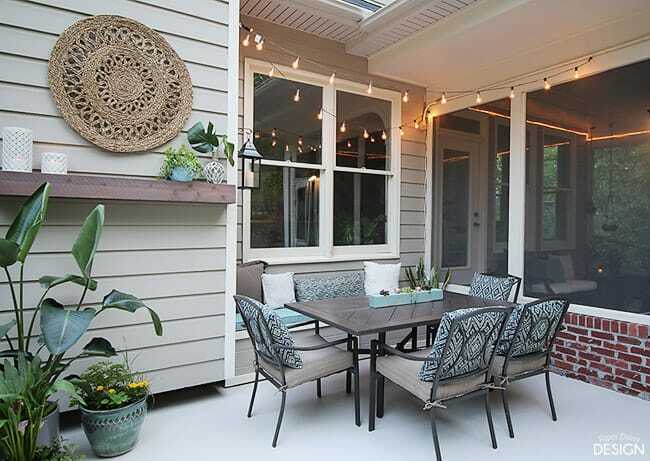 The patio is fabulous. Great job all around. 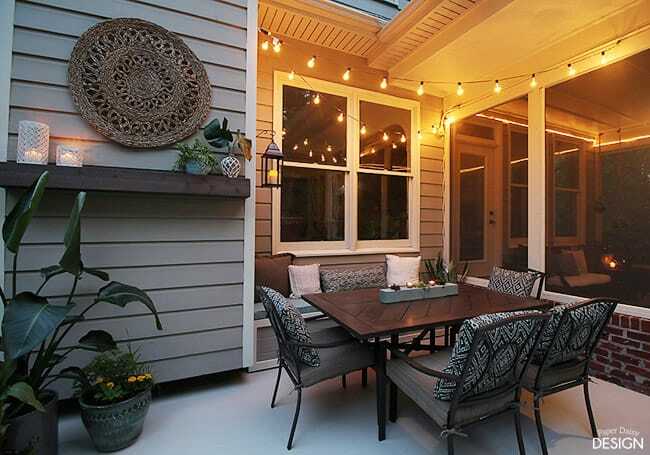 Such a fresh, amazing space…perfect for the upcoming seasons!! Gorgeous! 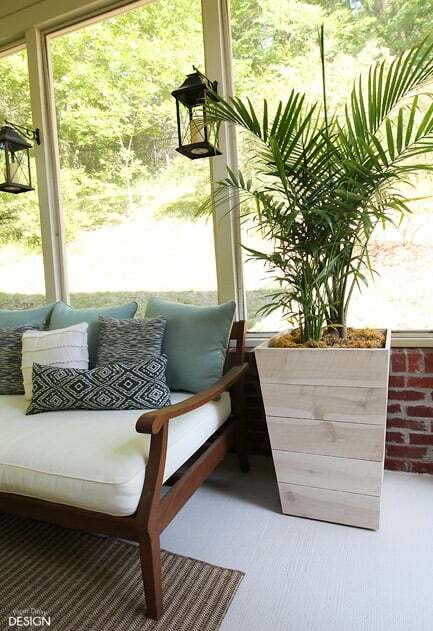 What a great space to relax in! Great job! 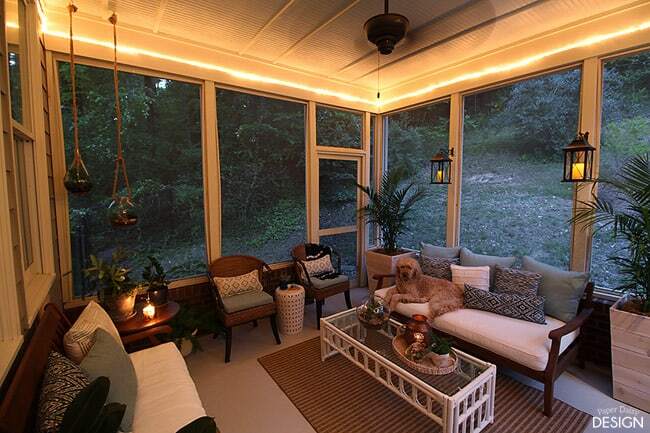 If that were my patio/porch, I would never want to leave. You created such a peaceful place to enjoy throughout the summer. Great job! What an oasis! You killed it girl! 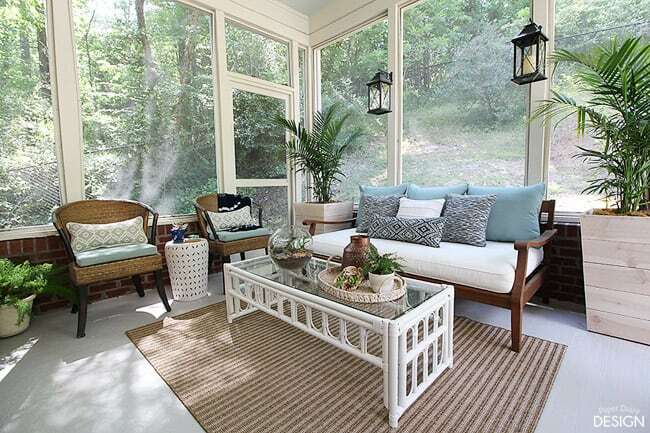 I think I’d like to move in to your screened in porch. Looks so beautiful and inviting. The whole space turned out beautiful. Looking forward to see what else you do out here. Thanks so much for sharing! This really turned out beautifully! 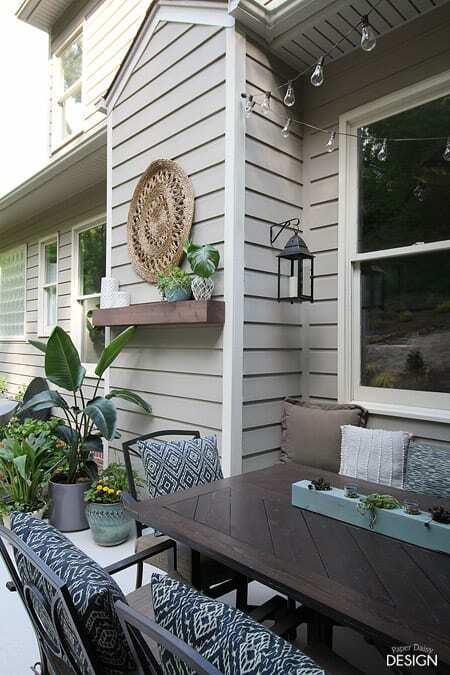 Can’t wait to read more about your DIY bench! 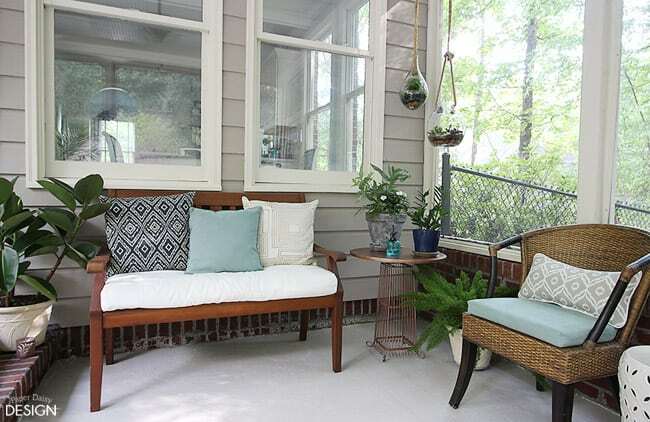 I love how you pulled the palette through to both of the spaces, it looks beautiful and so serene! 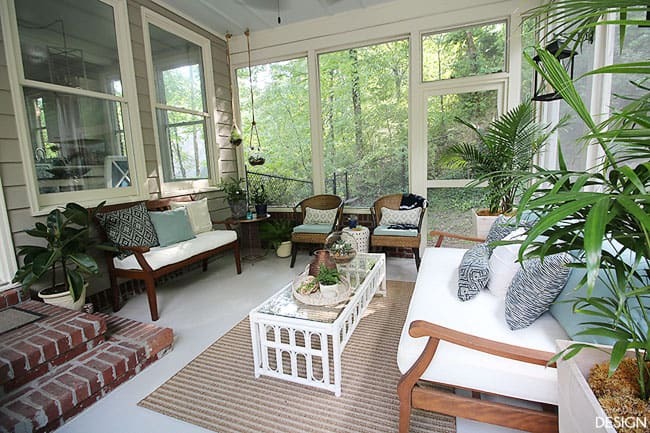 I have porch/sun room envy. I love every last touch that you put in these spaces. Those lights outside are a lovely addition. This is definitely my Nantucket dream. Great job. My family is always happy when the ORC is over, too. Bravo. Cozy and stylish space! Love your mantel! Everything is so well-thought of, I know your gonna be having a lot of fun times here! Great job! This ranks as one of my favorite transformations! I love every single detail. I would seriously hang out here all of the time!